Furor Erupts Over Susan G. Komen Halt Of Grants To Planned Parenthood : The Two-Way The breast cancer charity says it has stopped the grants because of a congressman's investigation into whether Planned Parenthood has used public money to provide abortions. Planned Parenthood says Komen is bowing to political bullying. 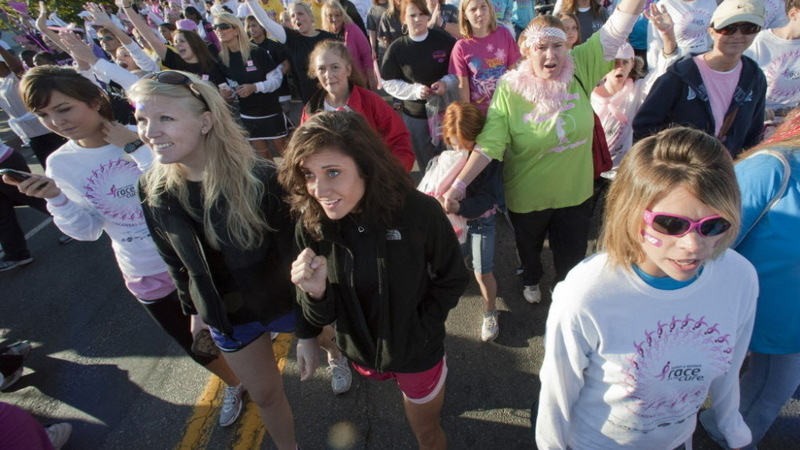 A Susan G. Komen Race for the Cure in Little Rock, Ark., in 2010. The reaction has been intense this evening to the news from The Associated Press that "the nation's leading breast-cancer charity, Susan G. Komen for the Cure, is halting its partnerships with Planned Parenthood affiliates." "Komen's decision hurts women — it puts politics before women's health. @komenforthecure should be ashamed." "I am crying n a cab at this Komen decision. Tomorrow we will rally. Who is in this fight with me! You can no longer sit idly by." "I will be halting my support for Komen and I will be telling them why. According to the AP, the Komen foundation says it has stopped sending money to Planned Parenthood affiliates — who used the funding to provide breast cancer screening and education programs to women — because of an inquiry initiated by Rep. Cliff Stearns, R-Fla., into whether Planned Parenthood has used public money to provide abortions. The Komen foundation's position is that it does not give grants to organizations that are under investigation. It gave about $680,000 to Planned Parenthood affiliates last year and $580,000 the year before, according to the AP. Planned Parenthood says Komen grants have paid for about 170,000 breast exams in the past five years. "Anti-abortion advocates and websites have criticized the Komen foundation's financing of Planned Parenthood for years. And in December, LifeWay Christian Resources, which is owned by the Southern Baptist Convention, said it was recalling a pink Bible it was selling at Walmart and other stores because a dollar per copy was going to the Komen foundation and the foundation supported Planned Parenthood." Richards also issued a statement saying Planned Parenthood is "alarmed and saddened" that the Komen foundation has "succumbed to political pressure." A Komen spokesman, though, told the AP that such criticism did not play a part in the decision. And Komen said in a statement to CBS News that "grant making decisions are not about politics." "As a breast cancer survivor, I applaud the decision made by the Komen Foundation to discontinue their partnership with the billion-dollar, abortion mega-provider, Planned Parenthood," Americans United for Life President and CEO Dr. Charmaine Yoest said. "The work of the Komen Foundation has life-saving potential and should not be intertwined with an industry dealing in death."